A New Mac Tip Every Day: Importing music from CDs in iTunes! Importing music from CDs in iTunes! One default setting that I change very quickly in iTunes is the "Import Settings...". Hard drive space is so cheap nowadays that there is just no reason to encode music at 128 kbps anymore. 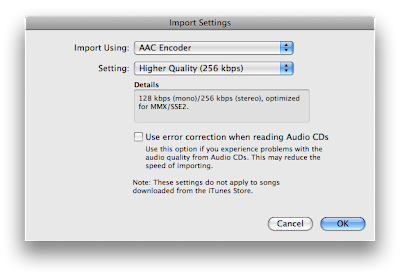 There is a preset that you can switch to so that future CDs that you import in iTunes are encoded at 256 kbps. The Custom settings will let you go up to 320 kbps. The Import Settings are in the General Settings. I change this setting quite often depending upon what I'm importing, if I need an AAC file or MP3, etc. (I work in audio) Would you happen to know how to get apple to make it EASIER to change this setting - like in a pull down menu in Itunes rather than having to go into preferences? It could be so much easier to change on the fly if needed. Is there a way to get Apple to make ANY settings easier or better? John C's pull-down menu in iTunes sounds like a clever and simple improvement. I would like to know if there is some way for Mac users to communicate other ideas and recommendations for Apple's consideration. I think the best suggestion is to get your favorite song/album, and rip it at both qualities. Give it a good listen on your best speakers, and decide for yourself. My current iTunes database is about 10 GB, if I had encoded everything at twice the file size it would be 20 GB, and wouldn't fit on an iPhone! I'm no audiophile, and I prefer to have all my tunes together. This is so true. For the past few years I've been encoding/compressing at the highest of fidelities, 320 kbps. As cd quality audio is being surpassed, I feel it's time for me to stop compressing my music all together and import in full quality. Don't you think that 10 yrs from now the next generations will laugh at the very idea of compressing our audio and video? Audio compression will probably go away, but not for video. I often work with uncompressed HD video for keying green screen and just looking at it, there is no visible difference with compressed HD video like Pro-Res. The consumer will go for higher resolution before going for uncompressed. Ten years from now they'll laugh at how huge our audio files were, because they have much better compression, and they'll use it. I think compression for all formats (text/audio/video) will always be there, and always be improving. 10 years ago, web pages weren't compressed at all - sent in plain text. Now, a majority of web pages are sent with gzip, even though bandwidth is much cheaper. Compression will always end up being cheaper than bandwidth or hard-drive space. A belated but very sincere thank you to Mark for the apple.com/feedback link. Don't know if you will ever get to see this, Mark, but I greatly appreciate your help. Renaming files in OS X! The best iDisk replacement: Dropbox! Kameleon now part of the bundle! Podcasts settings in iTunes 8! Sorting the Firefox bookmark bar by name! Tab stops in Apple Pages!